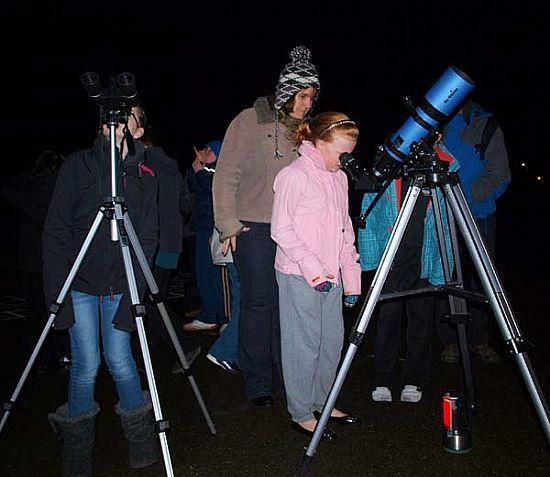 During the International Year of Astronomy, Caithness Astronomy Group held numerous public and school events, engaging the local population with the varied science and technology associated with Space and Astronomy. Caithness Astronomy Group (CAG) were able to purchase solar observing equipment that provided a new avenue for engaging with the local population that would complement our night time observing events. In 2012 these two organisations again generously provided funding to further enhance the solar observing educational capabilities available to our Group. * The slar observing equipment and educational materials were loaned out to 2 local high schools for extended periods to use during class time at their convenience. * A public event focussing on the aurora was hosted with guest speaker Ken Kenned (BAA Section Director) giving a talk on the topic and its link to the Sun. The northern lights is a phenomenon that has a lot of local interest with the general public and the funding supported a display of locally taken aurora photographs that was shown at this and 2 other public events later in the year. When not being used for the above, the new equipment was utilised for solar observing by CAG members. CAG intend to continue to make use of the equipment in this way and for any other suitable public and school engagement activities that may arise. We hope that the unusual opportunities made possible by the funding will have been memorable to all and may have sparked or re-kindled an interest in STEM subjects and the universe in which we live. You will need adobe reader to view this newsletter.